You may know him as one half of the hosting duo from the Gameroom Junkies podcast. But by the end of June, Patrick Wall will also be a certified pinball and arcade expo organizer. That’s going to look great on his resume. Mr. Wall and his organizing committee will present the first ever Southern Fried Gameroom Expo on June 20-22 at the Marriott Century Centre in Atlanta, Georgia. Normally, these type of events have humble beginnings with a handful of people getting together to celebrate a shared interest. However, this event looks to be packed to the gills with special guests and exclusive events. The Southern Fried Gameroom Expo is reaching for the brass ring right out of the gate. I was able to conduct an email interview with Mr. Wall about the preparing for the show, his responsibilities and what attendees can expect from the SFGE. Credit Dot: It is a tall order cutting the ribbon on your first gameroom show. What has the experience been like leading up to the big day? Patrick Wall: It has been a lot of work! But, for the most part it has been fun work. The hardest part was trying to stay motivated in the early days of planning when the show was so far away on the calendar. Luckily, the other members of the planning group are truly big thinkers and they never wavered on their vision for how epic the show should be. As things got closer, the excitement ramped up quite a bit with support from around the country, confirmed guests, and committed games. That stuff makes the work fun. 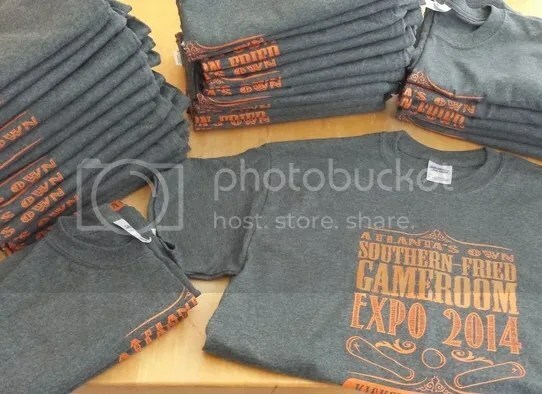 CD: How did you decide on the name Southern-Fried Gameroom Expo? PW: We really wanted a name that would be memorable, but also give the show the regional identification of being in the heart of the South. 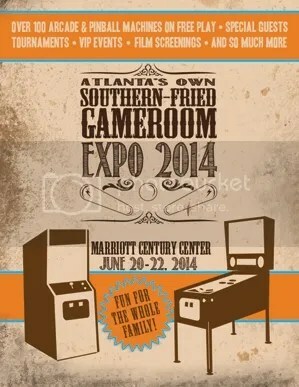 We toyed with the idea of integrating “Atlanta” into the name, but eventually just used it as a tagline: “Atlanta’s Own Southern-Fried Gameroom Expo”. We chose the term “gameroom” specifically because it would give the show’s scope room to grow beyond pinball and coin-op video games. I am thankful for that foresight because the show now features a retro-console gaming area as well as modern console gaming with exhibits by Microsoft and Sony. CD: Is there a lot of local buzz about the show from those not in the gaming community? PW: It is really hard to tell – we have not been picked up as of yet by any local media. By cosmic coincidence, our show falls on the 75th anniversary of the City of Atlanta outlawing pinball. That sounds like an interesting media hook to me! CD: Did you follow the framework adopted by other successful arcade/pinball shows or attack it with a clean slate? PW: We reached out to organizers of similar shows and they were all extremely generous with their time and they gave some valuable advice. All of that input was considered and we adopted the features and processes that we like the best from the other shows. CD: From what I have taken in from other media, you are just one member of a much larger committee for the Expo. Who are the other members? Does each member have a specific duty or role? PW: There are five of us who make up the planning group, called Player One, LLC. It is a great mix of talent and I really cannot imagine doing this without this group of individuals. Shannon Dewitt handles all of web related work, registration, and financial details. Preston Burt [Mr. Wall’s co-host on Gameroon Junkies] provides us with the graphics/art needed and he spearheads social media outreach. Dana Reeves is an expert in event planning logistics and she also handles all of the media outreach. Her husband, Joel Reeves, creates any show related videos needed and he is the coordinator of games. Lastly, my primary role has been to direct the special sessions/speakers and to develop the master schedule. CD: Some folks got a sneak peek at the games of the Southern Fried Gameroom Expo a few weeks ago at Momo-Con. Can you touch on what the Momo-Con event entails, what pinball machines made an appearance and the reaction of attendees? PW: Momo-con is an Atlanta based anime and gaming convention that draws about 13,000 attendees. Since Momo-con takes place a month before SFGE, we thought it would be a great chance get out and promote our upcoming show. We coordinated with the planners of Momo-con and agreed to bring a collection of pins and vids for a freeplay area at one of their host hotels. After renting a BIG truck, we were able to exhibit 21 video games and 3 pinball machines (Metallica, AC/DC, and Indy 500) from our combined personal collections. The Momo-con audience trends fairly young, but the reception was amazing. The games were constantly played for the entire weekend and the pins usually had a line 2 deep waiting to play them. It was a perfect time to talk with folks about the show and everyone seemed really excited about SFGE. CD: The key to any good Expo is the special guests! You’ve covered every base imaginable, from pinball designers like John Trudeau and Barry Oursler to video game celebs like Billy Mitchell (of King of Kong fame) and Walter Day (founder of Twin Galaxies) just to name a few. Being in such a niche hobby, were all of these guests accessible and relatively open to appearing at the show? PW: Yes, we are really proud and excited about the guests we have coming to be a part of SFGE. The key to that success was planning and contacting potential guests way before the event. Once we made that initial contact so early in the process, guests like John, Barry, and Billy were very open to our ideas and had a comfort level that things were being thoroughly planned out. Billy has been especially helpful in presenting ideas to make the show a success and reaching out to secure other great guests. CD: Given Barry Oursler’s recent health problems, will he still be attending the show? PW: As of this writing, Barry will still be attending. CD: I guess you could call the podcasters that are appearing EXTRA special guests? Which podcasts will be represented at the expo and do you have a Gameroom Podcast Symposium planned? PW: As the co-host of the Gameroom Junkies Podcast, one of the really cool things I’ve experienced with other podcasters in this hobby is that we all support each other in a variety of ways. When the hosts from the Brokentoken, Arcade Repair Tips, and Coast To Coast Pinball podcasts let us know they were coming to the show, we just had to get everyone together for a panel. We call it “Radio Free SFGE: Podcasting After Dark” and it is a late night session where do a wrap-up discussion of the show’s events and games. Also, Whitney Roberts and Brent Griffith (both from Brokentoken podcast) will join Jonathan Leung (from Arcade Repair Tips podcast) for a panel session about their experiences in arcade game repair. 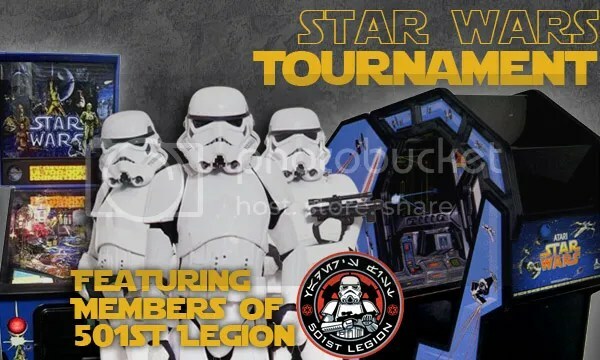 CD: Lets not forget about the games…how many pinball machines do you have confirmed for the show so far? PW: Our goal from the beginning was to have at 100 total games. We have 75 pins and 49 vids committed for the show and that does not include games that vendors may bring. CD: I see you didn’t beef up security, so you don’t anticipate pinball fans and video game fans to clash in a violent rumble in the parking lot. How are you going to maintain the peace? Joking aside, how hard was it to maintain a balance between the pinball and video representation at the show? Or was it even a consideration? PW: Actually, it was a consideration because the surge in the popularity of pinball has led to lots of folks wanting to bring pins! But, we really want more of a balance so we have had to look for ways to promote people to bring more vids to the show. There should be enough to please all tastes and our focus is really about creating a great show experience for everyone who attends. CD: You started a Kickstarter campaign late last year to help fund the event and offered advance passes, rewards and tokens of appreciation for backers at every level. How much did you end up raising? What was your reaction to this outpouring of support by the community? PW: The response to the Kickstarter campaign was really amazing! The concept that a stranger would pledge money to a gaming event that they may not even be able to attend still kinds of blows my mind. Dana and Preston we familiar with how good Kickstarter campaigns should be executed and they really led the way to making it a huge success. We raised almost $6,000 (not including the cut that Kickstarter takes) and I really can’t wait to thank our backers who are coming to the show. CD: How do you get over the initial fear of organizing an event and not knowing if anyone will show up? PW: It was certainly a leap of faith and I honestly had my doubts. There were times when I feared I would have to sell my entire game collection just to pay for my part of the show bills. But as I mentioned before, the other folks in the planning group were big thinkers who had a grand vision. We also had great sponsors like Atlanta’s Joystick Game Bar and Marco Specialties who believed in us and supported us early on in the planning process. CD: If you had to give a few key pieces of advice to someone who wanted to start a show like this in their area with respect to planning and organizing, what would that advice be? PW: Starting the planning early is the most important thing…and also include the local gaming community to help you. Unless you own a warehouse full of games, there is no show without them! 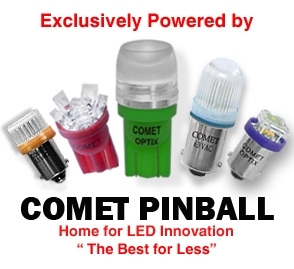 CD: Leaving the expo behind for one moment, what pinball machines do you have in your collection currently? What are some of your favourite eras of pinball games? CD: You are going to be a busy man on June 20-22. Do you think you’ll be able to find time to relax during the weekend and play a few games of pinball? PW: Oh yes…I definitely plan on playing some of the games. We have some volunteers lined up to help relieve some of our duties periodically, to allow us some downtime and for that I am truly grateful. The pre-order period for tickets for the Southern Fried Gameroom Expo has expired, however weekend passes and single day admission tickets will be available at the door. John Trudeau and Barry Oursler will appear together on Friday evening at 7:00pm for “The Silverball Sitdown”. Trudeau returns on Saturday afternoon for a session at 2:30pm entitled “Replay: John Trudeau and his Return to Pinball”, while Oursler re-takes the stage on Saturday evening at 6:00pm for “The Man Who Saved Pinball: 30 Years of Space Shuttle”. There will be a pinball giveaway shortly after this session with Oursler. Categories: People | Tags: Gameroom Junkies, Southern Fried Gameroom Expo | Permalink.